The Best Alternative to chewing Tobacco! Click store button to shop now! Must be 18 or older to use this site. If you are not 18 or older please leave now. Triumph Chew is a non-tobacco chew with nicotine. It is available in four great flavors and four strengths. So whether you want the same nicotine, less nicotine, or zero nicotine; we have something for you! If you want a no nicotine option with a little caffeine boost try our new line of chewing tobacco alternatives- Triumph Rush! Triumph Chew- Made by Chewers for Chewers! Triumph Chew is a tobacco-free chew or herbal dip that is available with or without nicotine. It is a very satisfying chewing tobacco alternative that feels like tobacco and also delivers the same "kick". All of our chews are available in multiple strengths so whether you want to cut back or just want a tobacco-free chew that can still give you your fix, we've got you covered. Our ingredients are all food grade with the exception of the nicotine. We use pure nicotine extracted from tobacco. Triumph chew is a perfect blend of ingredients that is made to resemble the texture, burn, and feeling of dip tobacco. All without tobacco! We use what you like about tobacco without all of the carcinogens associated with tobacco. The non tobacco chew that is called Triumph was developed to be the best chewing tobacco alternative on the market. We spent a lot of time developing the chew. We wanted to make sure that it not only satisfied but tasted great! 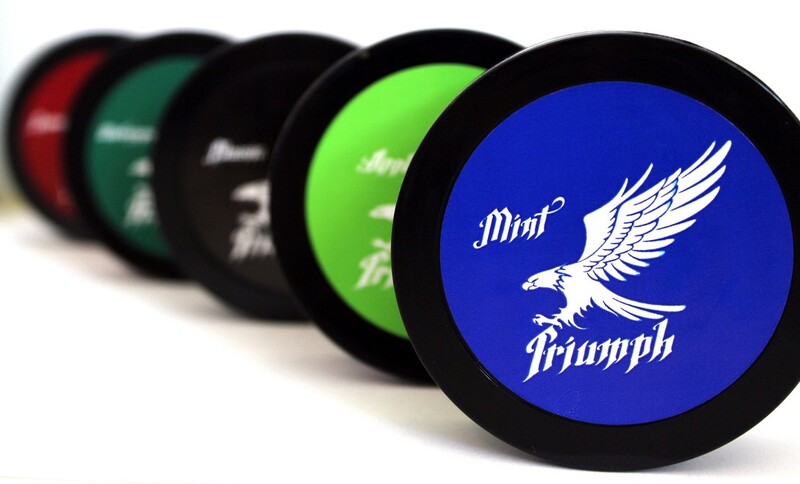 Triumph Chew is made with premium flavorings. Flavor is very important to us. A chewing tobacco alternative that doesn't taste good is not really an alternative. You have to like it. We know that we have a great product because it is one we use daily. We knew what we wanted in a non tobacco chew and we made it. We created a non tobacco chew that tastes great and satisfies! The product works for us and we know it will work for you too! We wanted people to have options within the product. We make a Full Strength which is the most comparable to a normal can of smokeless tobacco. We make a Half Strength which is exactly half of the nicotine of Full Strength. We also offer every flavor in a Zero Strength chew which contains absolutely no nicotine , but still tastes great. We also started a new line of Triumph with caffeine added. So if you want an option without tobacco and nicotine that still gives you a boost we recommend our new Triumph Rush. We care about our product and our customers. Compare us to the competition, we are confident you will find that Triumph Chew is the best chewing tobacco alternative on the market!